Cut a portion of your lace that is generously larger than the actual shoe. Turn your cut lace upside down (pretty side down, less attractive side up) and give a nice layer of spray adhesive. Starting with the toe portion of the shoe, place the lace with a good focal point on your shoe. 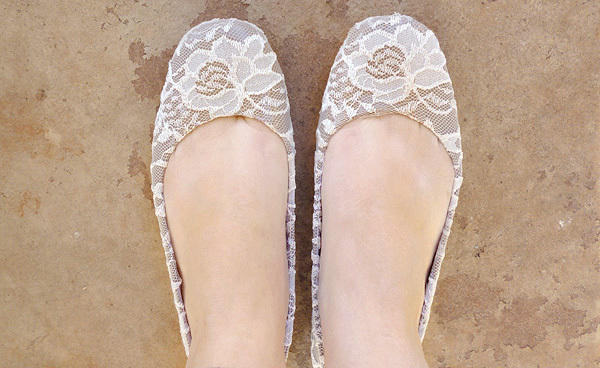 Smooth the lace down and around the entire toe and sides of both shoes. Allow to dry approximately for one hour. When you get to the back of the shoe, cut the lace directly down the middle. Take one side and pull it inward and trim any overlap with the center of the shoe. Glue down. Take the other side and trim so that the lace is just overlapping the first piece. Glue down. Continue with this step as soon as the lace is no longer tacky to touch, or if when touching the lace it doesn’t try to pull up with your finger. Run along the sole/shoe upper with a small brush and Mod Podge. Apply generously. This step is going to stiffen up your lace so that it will be easier to trim and prevent any unraveling after trimmed. Take your utility knife and run along the seam that connects the sole to the upper. Areas where the lace is thicker and more detailed will take a bit more pressure. Take care that you don’t push so hard that you cut through the shoe. Use your hot glue gun to trace just inside of the shoe in spans of about 3 inches. Turn the lace over into the shoe and tamp down on the hot glue to set. Quickly wipe away any excess. Your shoes are now wearable!